Hi everyone! I have really exciting news to share, but first I want to remind you [especially if you live near Rochester, NY] that I'll be vending at the Mini-Mayday! Underground show on Saturday. The address and times and all that are under the "WHERE TO BUY" tab up top. And now for the exciting news. Last week I asked for some feedback on some T-shirt designs. Although T-shirts are coming later in the summer, I decided to start off by putting the designs on baby onesies! Marinette, owner of Inspired Buffalo, is helping me with these. I was able to meet with her and she showed me her new, super awesome, HOW MUCH DID YOU PAY FOR THAT! direct-to-garment printer. If you don't know what that is [I didn't] YouTube a video of one in action because it's seriously magic. I chose to try this printing method for now over traditional screenprinting because I wanted to launch 3 designs at once and there isn't any extra fees for screen set up. The design goes directly from the computer onto your shirt, or in this case onesie. Plus you can use as many colors as you want and it doesn't cost extra... and we all know color is kinda my thing. I priced out what it would cost to screenprint with at least 6 colors and it's a lot... unless you buy hundreds. Which is too much of an $$$ investment at the moment... So I'm starting small with 50 onesies. Baby steps. Literally baby steps. They're baby onesies. Want to see them. Here they are! All the designs are available for preorder through my Etsy shop. I now have direct payment set up so you can use your credit card without having to go through PayPal. All preorders will be ready in July and I will email you to let you know when they are being shipped. Click the image to take you to the shop listing for that item. Onesies are $20 each or 2/$30. Sizes range 6 - 24 months. These are so fun and perfect for gifting... or for your own little monster. I changed my mind. Etsy shop updates will be on Mondays. I quickly realized that Monday updates gave me the weekend to prepare. Friday was much too hectic. So I will be adding new items to my Etsy shop on MONDAYS at NOON! Yay. New stuff. I have tons of ideas so this should be an exciting summer in the world of erinmakesstuff. Now let's move on to what's new! Did you know that the horn on a narwhal is actually a huge tooth that grows straight out from the whale's face! Imagine if our teeth did that! This little narwhal is certainly a cutie and would look great hanging anywhere in your home. This ornament is approximately 4" long and hand-knit from wool yarn. I have three available right now! Which is your favorite? EDIT: SOLD OUT- But I will be making more! Want to make your tablet cozier? This friendly monster will hug your electronics like a warm sweater! This cozy has a lot of stretch and can fit most iPad sized tablets, with or without a protective case. Thick crochet offers a little extra cushioning for your device. A button closure on the back holds your tablet snugly inside. It measures about 8 x 10.5 inches when flat. The Blue and Purple iPad Monster Cozy shown above is in stock! I also have a listing set up that you can custom order one in whatever colors you choose. This was a pretty busy week and I hope you all enjoyed the update! Soon I will be confirming some summer events and as soon as I know where I'll be, I'll let you guys know. Hi everyone! It's Friday and that means that I've updated my Etsy Shop! This week I listed two more items that you can custom order [Ducks and Phone Cozies!] and a Sea Monstapus who is not scary, despite having claws. Monster Cell Phone Cozy: Want to make your cell phone cozier? These friendly monsters will hug your electronics like a warm sweater! You'll smile every time you pull out your phone. By default each cozy is sized to fit an iPhone 4/4S or iPod Touch. Please message me your phone model in a note to the seller so I can size your cozy to perfectly fit your phone. A button closure on the back holds your phone snugly inside. Each monster cozy is hand-knit to order. It'll take me 3-5 business days to knit and then ship your order. You can pick the color stripes you want [see the last picture for color options] or, if you don't care, just pick "SURPRISE ME." Button eyes and yarn color of the mouth and arms will always vary based on what I have available so each one will always be one of a kind. These monsters are knit from acrylic yarns so if they get dirty, just hand wash them in the sink and let them air dry. Easy peasy. Ducks: Quack Quack! I'll knit you one of these ducks in the colors that you choose! Pick up to two colors [or if you don't care, you can always pick "SURPRISE ME!"] and let me do the rest. Now you can order an duck in your favorite colors, baby shower theme colors, wedding colors... the possibilities are endless! If you need colors beyond what is listed, add your needs in a message to the seller when you purchase. Each duck has the most adorable knit webbed feet! Ducks are knit from soft wool yarn and are about 7 inches tall. Eyes are sewn felt with locking black safety eyes. Each duck will have an "erinmakesstuff" tag sewn on its back. Sea Monstapus: I actually knit this guy as my submission to the Buffalo Etsy Team's May Creative Challenge. The theme for May was sea creatures/ sea life. I think this guy fits the bill! This monster emerged from the sea to look for a new family. He may have claws and tentacles, but he is harmless! In fact, he's one of the cuddliest monsters around and loves to give hugs. He is knit from acrylic yarns and stuffed with polyester fiberfill. This monster has one of the cutest button-eyed faces around, how can you resist? From top to bottom, this Monstapus measures about 11.5 inches. He has six tentacles that measure about 7 inches each. Want him? He's up for grabs HERE. Next Friday I'll have two new items. New items will be launched at noon [EST] in my shop! Look for posts on Facebook too! This summer I plan to launch two new products onto my Etsy shop each week. New products will be announced on my Facebook page on Fridays at noon EST. Each item is made to order and you can pick the colors! Last week the two items were MONSTER CAN COZIES and OWLS. Monster Can Cozies: Want to get some smiles at your next summer bbq?These one-of-a-kind knit monster cozies... or if you want to say "coozies" that's fine too... will not only help insulate your drink, but entertain your friends! And you'll never forget which drink is yours. These friendly monsters just want to be helpful. Look at those eager faces. Each monster cozy is hand-knit to order. It'll take me 3-5 business days to knit and then ship your order. You can pick the color stripes you want [see the last picture for color options] or, if you don't care, just pick "SURPRISE ME." Button eyes and yarn color of the mouth and arms will always vary based on what I have available so each one will always be one of a kind. 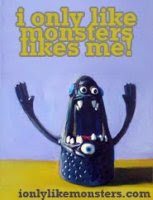 Monsters are knit from acrylic yarns so if they get dirty, just hand wash them in the sink and let them air dry. Easy peasy. Owls: Hoot Hoot! I'll knit you one of these adorable owls in the colors that you choose! Pick up to two colors [or if you don't care, you can always pick "SURPRISE ME!"] and let me do the rest. Now you can order an owl in your favorite colors, baby shower theme colors, wedding colors... the possibilities are endless! If you need colors beyond what is listed, add your needs in a message to the seller when you purchase. Owls are knit from soft wool yarn and are about 7 inches tall. Eyes are sewn felt with locking black safety eyes. Each owl will have an "erinmakesstuff" tag sewn on its back. Because this is a Made to Order object, please allow 3-5 business days for me to knit your owl before shipping. Trust me, it's worth the wait! These owls are super cuties! This Friday two new products will be launched. What will they be? Find out Friday! My holiday shows for the season are over so now I can focus on custom orders! Yay! So... if you missed my shows, I updated my etsy shop! Feel free to browse by clicking on the SHOP tab above or head right over to the etsy page to see what's in stock! http://www.etsy.com/shop/erinmakesstuff. There's lots of monsters waiting for you! In case you missed it, I put some new monsters up in my etsy shop. Meet them here. If you click the picture it should link you to where you can buy them. Every monster deserves a good home! Hi everyone! I just wanted to update because I added a few little round monster friends on etsy! Please check them out... they're the most popular of all the erinmakesstuff monsters so I expect they'll get snatched up pretty fast :) This batch is extra cute too.